This entry was posted in Israel, New York Times and tagged settlers, West Bank, Zionism by First.One.Through. Bookmark the permalink. I had been under the iimpression that Zionism was the idea to establish a Jewish State called Israel in the historicak Jewish homeland which was accomplished in 1948.The ensuing struggles involved the rejection of that State by the Arabs and the enhanced realizations of the needs of that Jewish State for its spiritual and existential survival.This perversion of the term Zionism is pure manipulation and anti Israel canard. You can kill the word Zionism and the fight would not end. “Zionism lacks a gentleness since it seeks to displace indigenous people.” LOL, this is the face of daily beheadings and genital mutilations by the Philistinian’s fellow Muslims. Thank you for posting this piece. 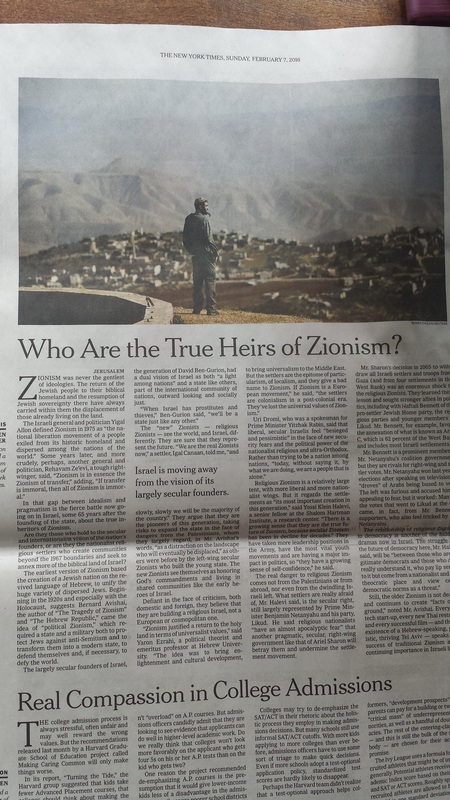 It hurts my soul in the worst way… I love the NYT, I love Israel and I am a fire breathing Zio. I appreciate this so much. Truly.